Dare to be different this Christmas with these striking Temporary Lip Print Tattoos , which will save you a huge amount of time at Christmas when you’re busy with Christmas activities, as you can transform your lips with a few easy steps! Make a real entrance whilst wearing Red Hearts Print Temporary Lip Tattoo, which are perfect for Christmas due to the beautiful white and red colour combination! They’re perfect for Christmas as they make you appear like you’ve taken hours on your makeup whilst in reality you’ve only spent a couple of minutes applying your makeup! Jazz up your Christmas outfit this year by wearing these Temporary Pattern Lipstick Tattoos which are available in a range of patterns from Rainbow Colour Print Temporary Lip Tattoos to Red Roses Print Temporary Lip Tattoo the choices are endless. Get lips like Kelly Rowland by wearing this pack of two Leopard Animal Print Temporary Lip Tattoos, which will transform your lips with an attention grabbing leopard print. These stunning Temporary Animal Print Lipstick Tattoos are available in a range of colours and animal prints for just £6.99! Check out this elegant pack of two Blue Glitter Print Temporary Lipstick Tattoos, which the queen of pop herself, Lady Gaga has been seen wearing! These temporary lip tattoos are perfect for Christmas as they will give you beautiful sparkling lips in seconds, and you will definitely attract some attention whilst wearing them too! These eye-catching Temporary Glitter Lipstick Tattoos are available in a huge range of colours, and they’re a perfect Christmas gift for just £6.99! 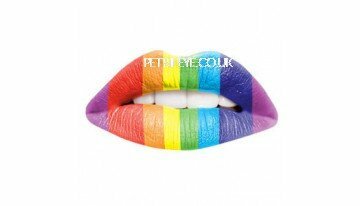 Visit Petrifeye.co.uk for more of our amazing Temporary Lip Print Tattoos, and whilst you’re there take a look at our huge range of Non-prescription Contact Lenses!